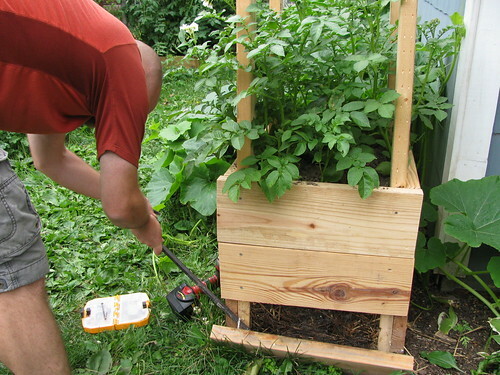 Plant 1 pound of seed potatos in a potato tower (described below) and nearly a hundred pounds of potatos will fall at your feet at harvest time. The premise is that each time you load up the tower with more soil, potatos send out more baby tubers that then grow into full size potatos. We planted a potato tower in mid summer 2009 with two pounds of mixed seed potatos gifted by a coworker of Alex and store bought red potatos. We harvested about five pounds of tiny potatos. My faith in the space saving potato tower was low. At the Ohio Ecological Food and Farming Assocation annual conference, I shared my not-so-awe-inspiring experience. A few people in the crowd had success with the potato tower because they started earlier in the season and allowed more growth between soil coverings. My interest was renewed. This year, we will start our potato tower as soon as the potatos from our group buy arrive and sprout. I am expecting them this week. Our tower is a 2 x 2 foot box with 4 feet of 2x4 inch lumber vertical supports. 2x8s form the sides. 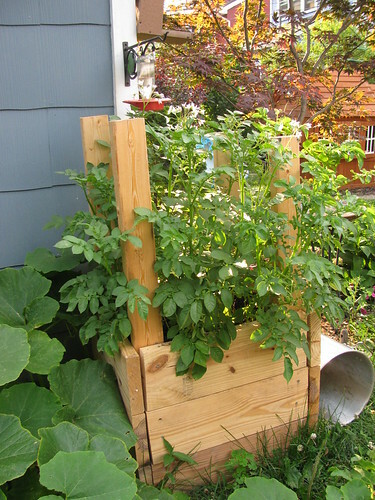 I have seen plans for potato towers made from stacked rubber tires or five gallon buckets slices too. The basic concept is to use something to contain the soil vertically. We will space a pound or two of a single variety of seed potatos right on the top of the soil. Store bought potatos sometimes produce but not always, so buying seed potatos is the way to go for a generous harvest. If you didn't order with the group buy, you can find a small variety of seed potatos at most garden centers. We will cover them with 4 or 5 inches of soil mixed with compost and some hay. When the plants are 8 inches above the height of the 2x8 side, we will add the second row of side panels and cover with 6 more inches of dirt, always leaving at least 6 inches of plant growth. We will add soil at least one more time. When the leaves of the plant begin to yellow, we will remove the sides and mountains of potatos will fall at our feet. That's the plan, anyways. Rob from One Straw: Be the Change has a nice summary of his experience with the potato tower. His yield with the tower was similar to mine and he was not impressed. Rob suggests two other space saving techniques: growing potatos in buckets and in a straw bale. 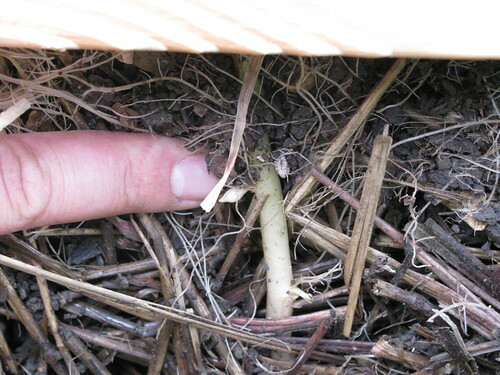 Seeing as we have one of each of those already, we will try those two methods and stick some seed potatos in a raised bed for a solid comparison of potato growing techniques. Stay tuned for updates on the great 2010 potato growing showdown. How do you plan to grow potatos this year?